After roaming around Munich solo for half a day, I bid goodbye to Germany and continued my journey to the city of Innsbruck in Austria to meet up with hubby. 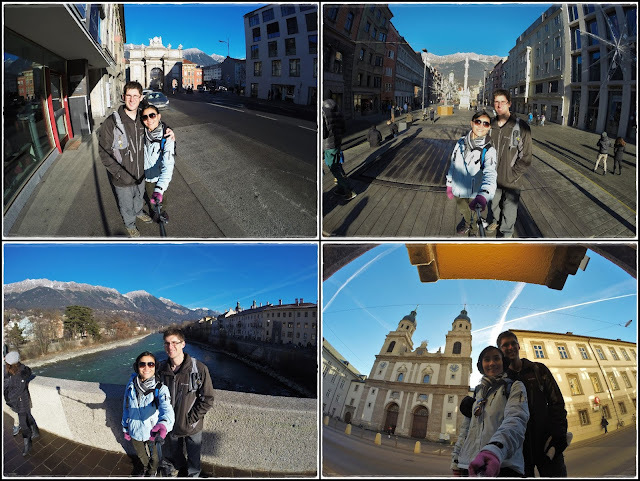 I don't really remember why we decided to make a stop in Innsbruck but I guess it was the nice winter (snowy) photos and its proximity to Munich that brought us there. Innsbruck is supposed to real pretty in winter and a popular vacation spot for Christmas but unfortunately, it didn't snow at all before and during our trip (thanks for making your point global warming). I was indeed a lil' disappointed by the fact that the alps looked kinda sad without snow. Oh well, traveling requires some luck. At least we had clear blue skies so I can't really complain. We were both starving after hours of traveling and was happy that we made it in time to have Christmas dinner together at Theresienbräu on our way back. We saw the old town briefly the night before so we went back the next morning for more sightseeing. Triumphpforte and St Anna's Column (Annasäule) with Nordkette mountain range in the background. Clockwise: Cathedral of St James, Innsbruck’s City Tower (Stadtturm), random door that attracted hubby's attention, Golden Roof. 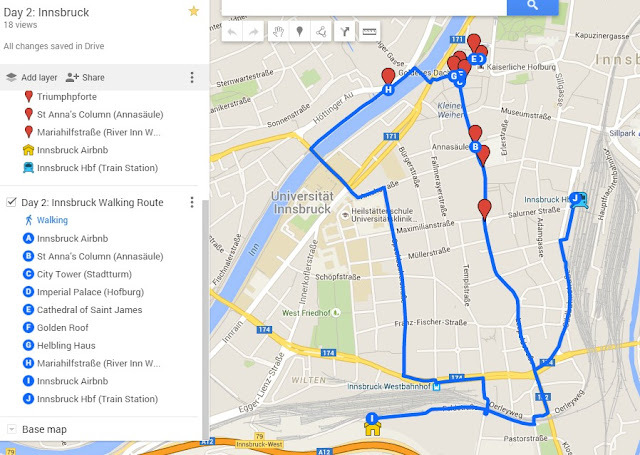 Walked 2km from the apartment to the train station (Innsbruck Hbf). Felt like I couldn't life my shoulders after walking half an hour with 15 kg on my back...good workout...haha!! Lastly, our route map for Innsbruck. Since hubby couldn't join me for the home trip this time around, we decided on a Meet-Me-Halfway 2.0 to celebrate Christmas and New Year together in Europe. This trip was booked since March and as mentioned in my previous post, I booked my flight back to the US with a stopover in Munich while hubby flew to Innsbruck from the US. We chose to visit Central Europe this time coz we both have never been to this part of Europe and it's supposed to be pretty during winter/Christmas. 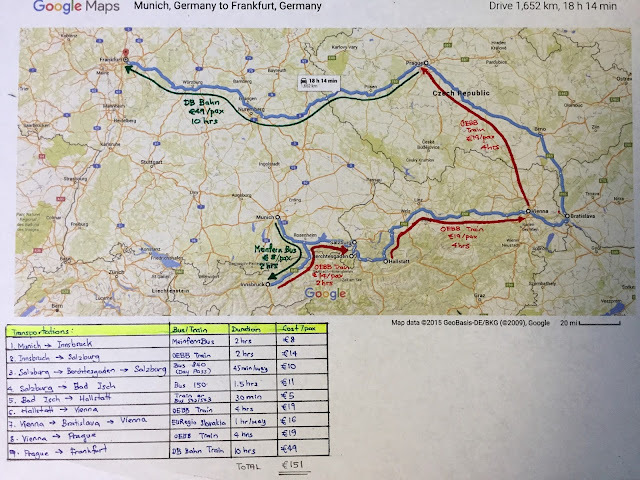 My last Western Europe trip was easier coz I went with a tour group, and this was my first time planning a Europe trip hopping through several countries. It took us quite some time deciding on our route for this trip coz we wanted to see as much as possible within 10 days, but also had to take into consideration the travel time between countries/cities. My initial plan was to cover 5 countries (i.e. Germany, Austria, Slovenia, Slovakia, and Czech Republic) but after spending days researching all the public transportation options, we decided to leave out Slovenia (Lake Bled) and Berlin. We also thought about renting a car but decided not to take the risk and stick to public transports instead coz we were worried about having to drive in snow/ice. One lesson I learnt planning this Europe trip was to NOT start planning for travels in December too early because the European train schedules changes from 13 Dec 2015 (2nd Sunday) onwards, and train bookings for dates after the December timetable change only open around mid-October, which is much lesser than the typical 90 days window. I admit, I wasted a whole lot of time trying to plan our itinerary during early September and ended up frustrated coz the search results either show no trains or only some odd trains here and there. Then I stumbled upon this website and realized the reason I was hitting a brick wall was simply because booking for our travel dates hasn't opened and the data wasn't loaded yet. Anyway, we managed to finalize our routes and book most of our tickets on OEBB (Austria intercity trains) and DB Bahn's (Prague-Frankfurt train) website by end of October. We didn't consider the Eurail pass coz buying separate individual tickets in advance was much cheaper. As much a planner I am, I nerdy-ly made a hardcopy map of our routes with the costs for each leg...lol!! If you're wondering how we navigated ourselves around each city, I had a pretty detailed itinerary and an offline map (using an app called Map Plus) with all the attractions pinned and directions mapped. I'll share it later on in my final post for this Europe trip. Had a 6-hr transit in Singapore and landed just in time to take the 6pm free transit tour to see the Christmas decorations around the city. The city lights tour was supposed to stop at the Merlion and Gardens by the Bay but since it was Christmas Eve and a lot of roads were closed, the Gardens by the Bay stop was replaced with a drive through Orchard Road instead. So happy that this flight wasn't full and I had a whole row of 3 seats for myself! SIA flights had always been full during my previous travels so this 'emptiness' came as a pleasant surprise. =P Made myself super comfortable and slept almost 10 hours...haha! Arrived Munich at 5am and was welcomed by an empty airport. =P Had a good rest onboard so was refreshed and ready to spend half a day exploring Munich all by myself. I intentionally scheduled my bus to Innsbruck later in the afternoon so that I could spend few hours walking around Munich since I've never been here. Well, one more city for me to mark on my trip advisor map...why not right...haha!! Empty Christmas market in Munich airport on Christmas morning. Started my solo sightseeing adventure at 7am and apparently it was way too early. The sky was still dark (full moon still clearly visible) and the streets were deserted. Here comes the A.B.C. of every Europe trip...Another Big Church...St. Michael's Church and Bürgersaalkirche. Caught the very last bit of closed Christmas market before everything was taken down. Marienplatz Square...the city's main square was also deserted. Pardon me for constantly emphasizing on the desertness coz how often do you get to experience such quietness and 'emptiness' in a big city like this? So if you are anti-social like me and enjoy sightseeing without anybody around, start your day early on Christmas morning. The song All By Myself was playing in my head all morning...lol!! And more churches around the square...Heiliggeistkirche, St. Peter's Church, and Old City Hall. 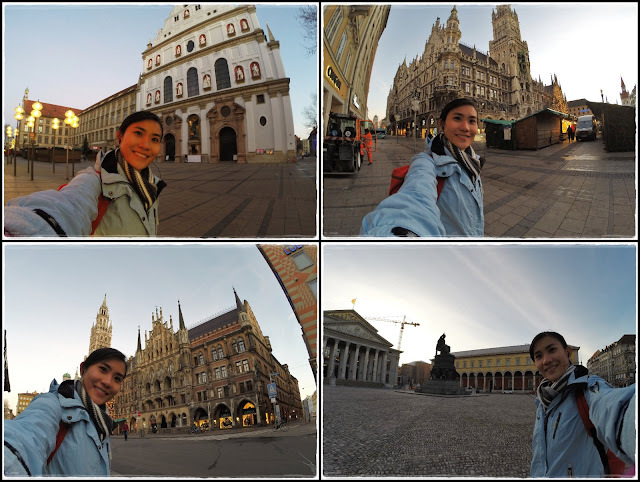 Gotta improve on my GoPro selfies skill...how did I end up blocking and cropping off the buildings...haha! And so I continued walking further to Hofgarten...this place was court gardens of the Royal residence in the 17th century. So glad that the sun is finally up!! English Garden...saw some hardworking people running around the park on Christmas morning. Saw this cool window display of many cute moving teddy bears on the way back to the train station. Spotted our Munich office right beside the bus station. Mountainous landscape along the 2-hour journey across the border from Munich to Innsbruck. 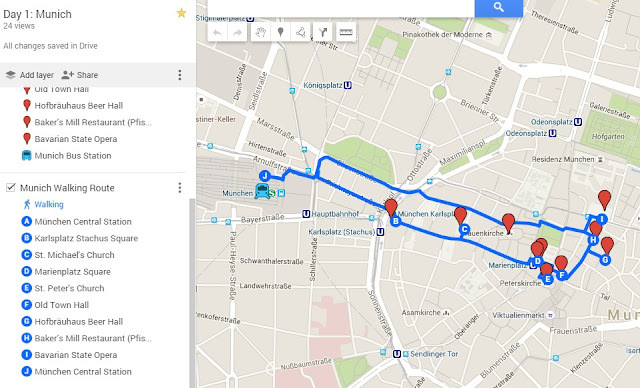 Here's my walking route map for Munich. That's all for my productive day of sightseeing in Munich...next up...Innsbruck.